1001 cartes: Holiday Photo Card Blog Hop! 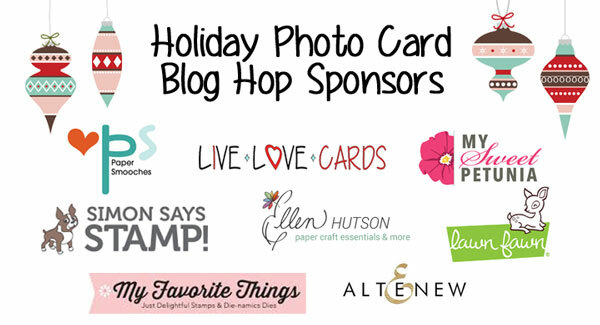 Holiday Photo Card Blog Hop! 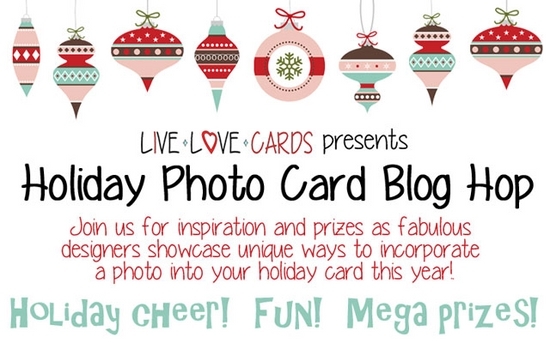 Hello and welcome to the Holiday Photo Card Blog Hop hosted by Darlene from LiveLoveCards! I’m SO excited to share this post with you! Thanks so much for having me in your line up, Darlene! I’m thrilled to be part of the hop. This hop is about holiday and Christmas cards that incorporate a personal photo. Darlene from LiveLoveCards creates one each year and this time, she thought to make a hop out of it! How fun is that? I love the idea. Make sure you hop around to all of the blogs featured in the link list at the bottom of this post. You will find lots of inspiration for your own Christmas cards! I had a hard time choosing a photo for the card. I had so much ideas and photos. I first wanted to use a Christmas photo of my cats with a santa hat. But I then came up with the idea to use a photo of my Christmas cookies! I decided to combine this photo with a fabulous clear stamp set from Lawn Fawn called Baked with Love. It matches so perfectly! I first printed my photo with a white frame (it looks like it was matted on a white cardstock). I created a top-folded card base from white cardstock. I glued red gingham paper to the background and fixed my framed photo on top. I only placed glue on the center. If the edges are free, it gives more dimension to the layout. I squeezed the photo and the patterned paper with a stapler tool from Tim Holtz to add interest. Next, I colored the images from the Baked with Love set with Copic markers and fussy cut them with scissors. I fixed them to the background with foam pads. I die cut the Simon Says Stamp Merry Christmas die from black cardstock and fixed it to the background with Multi Medium Matte glue. The "wishes" sentiment and the star cookie are from the Lawn Fawn Sprinkled with Joy set. If you like cookies, you should give it a try! They are so easy to make! I hope you like this "out-of-the box" holiday photo card using a picture of my cookies instead of my family LOL! Maybe you'll send your favorite recipes to your friends too? Winners will be selected at random from the comments left on each blog hop stop. Be sure to leave a comment on each stop to increase your chances to win! Leave your comments by Tuesday, November 22, 2016, 11:59pm CT. The winners will be announced on LiveLoveCards on Wednesday, November 23rd, just in time for Black Friday. Clever idea to use the cookie photo. Now that the kids are grown we don't really take "Christmas Photos". I like the idea of non people Christmas cards. One year, all my people photos failed so I used the classic dog & cat shots for back up and I had lotsa comments about how fun that year's card was. What a great idea! Thanks for the inspiration! Awesome idea - I LOVE to EAT cookies BUT am a terrible cook LOL!!! What a great idea to use the cookie picture, I love it! I'm dying from all the cleverness on this hop!!! I LOVE THIS IDEA so much! Your card is adorable! Great way to mix love of cooking and crafting! What an interesting idea! I love to bake and would love to receive a card like yours. What a GREAT idea using photos of baked goods AND including the recipe with the holiday sentiments! Although I would have LOVED to have seen the photo of your cats with santa hats! LOL Thanks so much for sharing this great holiday idea ... I will be looking through old family photos as we have a yearly event where everyone from 2 to 92 comes over for a day of frosting sugar cookies, and I know there has to be a really FUN photo I can use for my cards this year. Thanks for the inspiration!! So clever to use a recipe as part of your card...it makes it extra special to share a beloved recipe with friends and family! Such an awesome idea!!!!!!! I love this! Oh, this is super sweet! This is an adorable card, using the cookies as the photo is brilliant, and I can see people loving it!! Oh, I love the sweet images with the photo. Those cookies look so yummy! Wonderful idea of a cookie photo card with recipe. If i was a recipient I would like some of the cookies as well. Heehee. Just call me the Cookie Monster. What a fun card and great idea!! Thanks for sharing!! I love it!! That's my kind of Christmas card! What a u inquest no different ide for a photo. 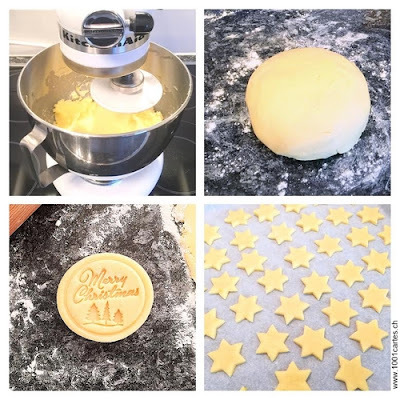 Love the idea of a cookie photo and bonus recipe! Beautiful card - the lawn fawn set IS perfect. Thanks for sharing. Well, all, well, how clever of you to think of this card & recipe!! Love it! Love the non-traditional use of photo and targeted something we all enjoy at the holiday season...tasty goodies :). I'll have to consider that for myself. I love to bake so this one really spoke to me. Great ideas and love the card. Love the card, I'm in love with lawn fawn products so this was my favorite. It's a great idea to send a recipe as a Christmas card instead of a family picture. Is always the season of sharing. Thanks for sharing the recipe. This card reminded me of my childhood. Love it. Cute take on a photo card - love the design. Great inspiration. Adorable.. what a way to get into the spirit of things.. this is awesome... thanks so much for sharing this wonderful idea. This is a great idea! Love it! Love your unique take on a photo card, super cute and yummy! Cute card and great idea to include the recipe! what a fantastic idea! if only I could bake, this would be perfect! Love how you found a photo to match the Lawn Fawn stamp set. Love any ideas to stretch those stamps. definitely one of my fave on the hop! FABULOUS idea!!! Most people think family and or pet pictures. Never thought of cookies. And really the holidays are not the same without the holiday cookies!!!!!!!!!!!!!!!!!!!!!!!!!! yummie foto card and recipie. Very creative design and I like that you included a yummy recipe. Photo cards are great to stay in touch with loves ones. I love this idea of sharing a cookie recipe with my Christmas cards. Who doesn't love a warm cookie at the holidays? Such a great idea & you made me close my eyes & imagine the smell & warmth of my g'mas kitchen! What a fun and just brilliant idea for a card! We do a lot of cookie swaps here and this would be perfect for guests!!! Thanks for sharing!!! Love your idea! May have to try those cookies! I love this idea. 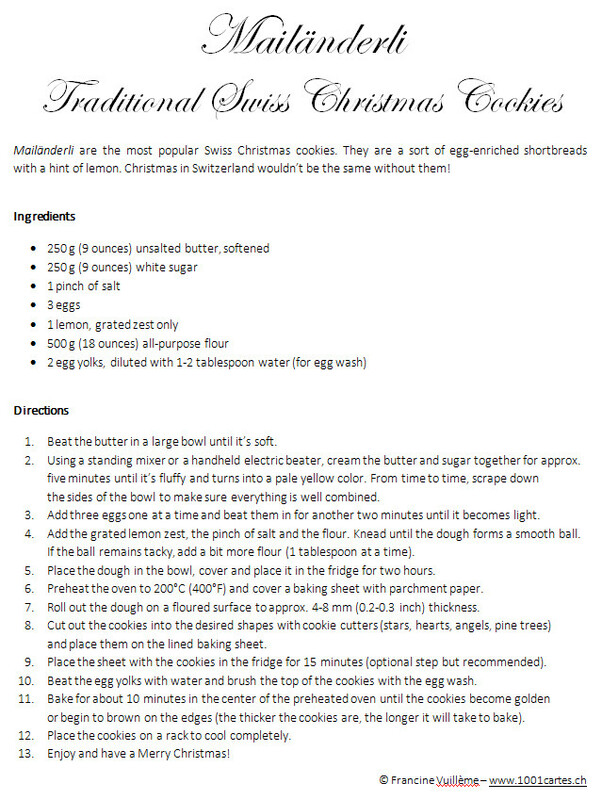 I have a cookie recipe that has been passed down through the generations and I use it every year to make Christmas cookies. Thank you for sharing. What a great combination of photo and stamp. Love this card! Makes me want to eat some cookies. I love this card!It's yummy , fun and a great alternative to sending family photos.Thank you for the inspiration! Great card! A bonus recipe too...awesome! LOve the card. Love Lawn Fawn. Cookies look ready to pick out of the picture and eat. Love that your enclosed the recipe with card. Great idea. Such a great card, the coloring on the tiny little elements is just perfect! Your card makes me hungry! Thanks for the recipe. This is such a wonderful idea. A picture of your cookies with a recipe. Anyone would love getting a card like this! Really clever! Different but so true!! Great idea to use the cookie photo! They look gorgeous! have to try the recipe! Francine!!! My husband would rather see cookies than ANYONE's family!!! A wonderful idea... I'm saving your recipe - thanks so much for sharing it! Your cookies look yummy! Your card s so cute and thanks for the recipe. What a fun idea! I love your card and it is a great way to share traditions with faraway friends. Cute card! Love the photo, those cookies look so yummy!! Cute and fabulous idea to take a photo of cookies! YUMMY card for sure! This is definitely a sweet treat! Merry Merry! aw, now everyone will enjoy receiving this card! cute idea! What a great idea, I would never have thought of it! Thanks for the cookie recipe!! The card is so much fun and the cookies look yummy! This is a very creative way of using a photo, usually when we think of photo card we think of children or families this is just great. Thanks for sharing. I love, love, love this. Great idea to use a photo of your Christmas cookies. Thanks for sharing. Love this idea for cookies! Great idea to share a photo of the cookies. We do not share many people photos anymore, but cookie making would be a fun idea to share. Absolutely adorable card! Great idea to use a non family photo for this situation. Brilliant! Good idea to add a photo of the baked product and add the recipe too. So cute and love the recipe idea. Awesome!!!! Now I'm hungry! :) Very cute card, how do I print out that recipe? Oh this is so cute! Love your Christmas cookie photo card! What a great twist on the "photo" card idea. You are amazingly creative!! Sending a recipe card is brilliant! Love it! I think this is a genius idea!! And what fun for someone to receive a recipe for a new cookie. And how perfect that Lawn Fawn has the perfect set to pair with your photo. Such a clever idea using a photo of your cookies. I love how you designed your card. Great job. What a lovely photo of your baking and a great idea to send a family or traditional recipe across the miles! I love your design and your baking embellishments. Anyone who receives your card is going to crave cookies! Super work! Love the recipe...looks really good. Thanks for sharing. LOVE your ingenious interpretation of a 'photo' card, Francine; pretty and scrumptious! Adding the recipe elevates this even more (and trust me, this card is on the highest level possible!)! I'm keeping the recipe to try out...and if I'm successful, who knows...maybe I'll be *casing* your idea with a few 'tasty treat' cards of my own! Thank you for the brilliant, heart-warming inspiration! Beautiful, unique card. I would have never thought to use a photo of Christmas cookies, but it's great. Yum! What a super idea for a Card! Genius! Thanks for the fun idea! What a unique ides for a "photo card"! I will definitely try the recipe, as I'm always looking for new cookies recipes. My first thought when your photo loaded was Yummy!!! Love the idea of sending the recipe with the card :) Great job. Thanks for sharing! Wow, surprised me the idea, I love it! This is adorable! I love that you used a picture of cookies! I may have to steal that idea! I absolutely love this idea. It is a fantastic match with the Baked with Love set! Enjoyed seeing a new, different approach to a holiday/Christmas card. The cookies look tasty and like getting a new recipe. I may be doing this with a fudge photo and recipe. This is a great idea for a Christmas card! Those cookies look yummy and it's so festive! Plus, it definitely makes everyone ready for the wonderful treats of Christmas. I love this! That is a fabulous way to send recipes to family. Sometimes around the holidays I want to send more than one card, to share the love, but I don't always know what to put in the second card. Thanks for sharing! Photo cards are so much fun and I really love this idea! Thanks for the inspiration! Love the idea of sharing recipes. Beautiful card!!! Great idea using a cookie recipe and photo !!!! Awesome card - Great idea using the cookies you made. Thanks for sharing the recipe too! Great photo of your cookies and thanks for sharing the recipe! Love the added stamped embellishments! Now I need a cookie! Love your "out-of-the-box" photo idea for a Holiday card. Wish I was a baker so I could do the same. Love this idea to share cookie recipes! Very clever! 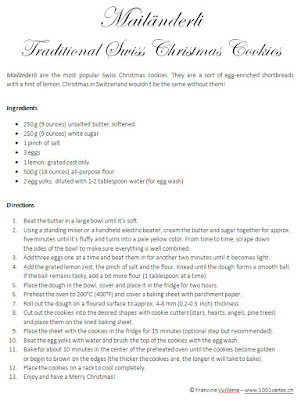 Great idea for a christmas card and those cookies are making my mouth water so now off to make some for myself. I love to bake so really like this!! Nothing says Christmas like butter cookies, darling card! What a great way to create a photo card! Super cute card, so clever to combine love of crafting and baking! How cute! I love your idea to include the recipe inside your card! Interesting card. I never would have thought of making a card based on recipe. Since I am from Louisiana, my family has always gathered around a good meal. I am the the one in the family who always makes the desserts so, whether it is cookies for Santa or the kids, I always have some around. Thanks for sharing your cookies. Charming card. 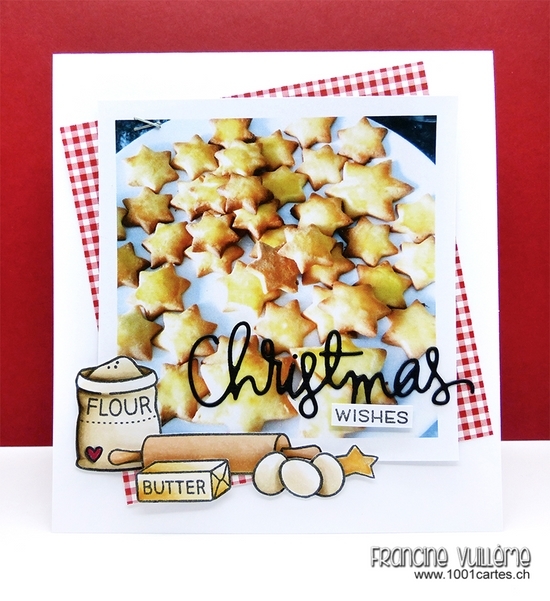 I love the idea of "sharing" your special Christmas cookie recipe with family and friends as a card! Mixing photos with drawings is very effective here! This is so AMAZING! What a fabulous way to share recipes! Brilliant! Such a wonderful recipe photo card! Thanks for sharing and for the cookie recipe. Happy holidays! I like that you coordinated the cookie photo and your recipe with cooking related stamps. Such a cute card and a cute idea. If we had received your card in our home, my daughter would have made these yummy cookies so fast! Such a cute idea. I would not have thought to create a card to send a recipe. Very original! Those cookies surely do look yummy! such a unique and clever idea for a holiday card-and thanks so much for sharing the recipe too! 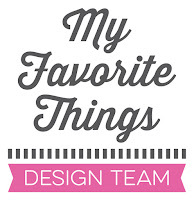 Wonderful idea and fun blog hop!! Adorable card!! Love the picture, unique!! Great idea to use the food picture - not everyone has a family photo to use, and sometimes you just don't want your picture taken! This is an adorable card idea! It's beautifully created and the cookies look fantastic. Thanks for sharing the recipe as well as the card idea! Love this idea. And thank you for the recipe. Love this idea. Thank you for the recipe. After a crazy trip to JC Penney to get Christmas pics this week, I'm totally digging your idea of using a non-people picture for our card. lol Love your coloring! My family makes so many cookies. I love the idea of sending a vintage family recipe! Wow, the cookie photo really blends in to your baking scene on your card - fabulous! This is a great idea Francine, especially to the people on your Christmas card list who like to bake. Its as good as a present! I love awesome recipes, TFS yours! Wow...good idea, but it did make me hungry!!! I love your design style Francine. What a great idea to use holiday food pictures! Genius! Never thought of using a photo of something other than people! Just may try this next year! What a great idea, to share a favorite recipe for a Christmas card! Thank you for sharing your idea. This is so cute - so talented!!! What a great idea to do instead of a family photo! How clever you are, Francine! I love that you chose your fabulous Christmas cookies for your photo, and your sentiment is perfect! As always, your Copic coloring is flawless on all those sweet images, too! Thanks so much for your inspiration, and for sharing your cookie recipe with us...they look amazing!!! NOW I neeeeeeed a cookie. Cute idea. This idea is very unique! One I have never thought about before! Love it! What a brilliant idea! Your cards are always impressive. So happy that you were a part of this ho.! Your creativity inspires me! Oh how cute is this what an awesome idea!! Thanks for the future cookies! Very nice thanks for sharing! I love all the different ideas for photo cards! Such a great idea. Cookies sound delicious. Love this idea. I previously worked for a gourmet food company and they started incorporating recipes on their Christmas cards. Everyone loved it. Will need to try the recipe. Thank you for sharing. Nice card! And the cookies look delicious! Clever idea and I love that Lawn Fawn set too! My mom, sister, niece and my 3 daughters do a cookie bake every year and that stamp set has been well used in the scrapbooks. Love what you have created...so out of the box! What a fun idea. i love the idea of the picture of your cookies. What a great idea for a photo and include a special recipe. Thanks for sharing! Fun card and a nice idea to include your cookie recipe! Love the stamps you used! What a fantastic card and such a great idea to send your favourite Christmas recipe. The Lawn Fawn stamps are really sweet. What a wonderful idea sending a cookie pic and recipe! Brilliant! Yum cookies!!!! Now this is my favorite card! thanks for the recipe!